Coffee tables are the perfect spots to reflect your style. They're little galleries just waiting for pretty objects, books, and art. But the trick, of course, is accessorizing with the right combination of things: not too much, not too little. Just right. So I've rounded up a few good examples of coffee tables that have that just-right look, and I'll explain why they work. TIP 1: Vary heights. This simple wood-and-iron coffee table is handsome, but not flashy, so it can easily handle the visual interest you get from the wooden horse. One reason the horse works so well is that it has height. Repeat after me: I don't want all of my accessories to be the same size. 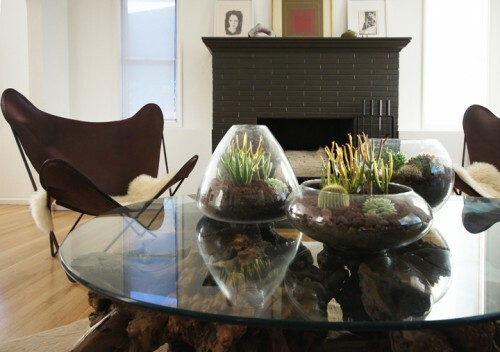 TIP 2: If you have a coffee table with a bottom "shelf," go ahead and put something on it. I love this wiry basket with the blanket inside: It's cozy, unusual, and a nice textural complement to the hard edges of a table. TIP 3: Build on a tray. Pretty trays add a tailored look to your coffee table, and can give you just the right amount of space to accessorize because you don't want to fill the entire coffee table. TIp 4: When in doubt, add a plant. (Back to tip #1: Plants add height, and the mix of organic items with hardback books is just fabulous.) Orchids, succulents, a grouping (three, perhaps?) of small vases filled with flowers--they all work. And you can even use a faux plant: In Denver, one of my favorite spots for faux plants is The Lark. TIP 5: When in doubt, go with books. A simple stack (or three) of nice-looking books--choose some that actually reflect your interests--topped by one unique object is a great way to accessorize. Remember the odd rule: It's generally better to have an odd number of items in a display than an even number. Next week, I'll share a few of my favorite sources for distinctive and beautiful decor items you can use on your tables. Until then!